Offering you a complete choice of products which include hot filled pouch or jar cooling tunnel. Since 1995, we are reckoned as one of the proficient manufacturers and exporters of Hot Filled Pouch or Jar Cooling Tunnel. This conveyor is designed and developed using quality examined components under the surveillance of our deft professionals. 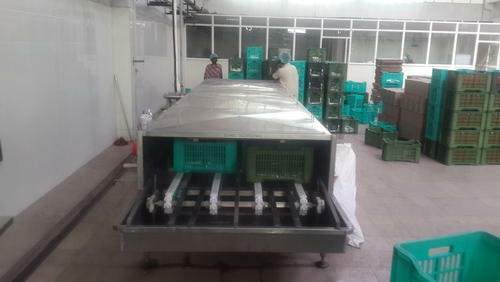 The given conveyor is utilized for cooling and transporting crate of food items. These conveyors are generally utilized in food industry for cooling numerous food products. In addition to this, the provided Hot Filled Pouch or Jar cooling Tunnel can be purchased from us in bulk at market leading prices. Looking for “Hot Filled Pouch Or Jar Cooling Tunnel”?